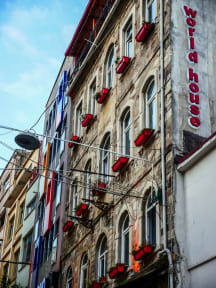 World House Istanbul offers comfortable beds, 24 hr hot water and a superb atmosphere in the heart of the city, the right fit for any urban traveller. Since 2005, we are working very hard to keep our hostel clean, secure, fun and still affordable. World House Istanbul is a 150 year-old Genoese-style stone building located just a few steps away from the iconic Galata Tower and the renowned Istiklal Avenue, and just several minutes away from the Sultanahmet. It can accommodate up to 82 people with its ensuite double and triple rooms, 4-bed, 6-bed, 8-bed and 14-bed dorms. We had a very comfortable and enjoyable staff. Perfectly located hostel and really friendly, relaxed atmosphere. Staff went out of their way to make us feel at home and Dogukan in particular was super helpful! Great beds. Also, the night manager insisted I wake him up at 6am (I needed to catch a taxi) so he could call the reliable taxi company for me. That's going beyond ! Good location near the nightlife. This is a preferable location to the Sultanimet side. They claimed the bathrooms are cleaned multiple times a day but there was shaven hair all over the bathroom on my floor for more than half a day. Other than that, the place is nice and has a good atmosphere, no doubt because it’s in a prime location just steps away from Galata Tower! Value for money. Very good location and a very nice coffee shop at the front ! Booked a private single room. Decently sized room and clean as well. But the main light wasn't working in the room. I had to spend 2 days and 2 nights only under a dim table lamp. On asking the staff to get it fixed, the response was very cold and non helpful. He just shrugged it away and pretended that nothing could be done. This was a huge turnoff. Breakfast was standard eggs, bread, butter, jam. Tea, coffee, tomatoes, cucumbers and olives. That's it, I think it could have been far Better. I got a bit disappointed. Reading all this great reviews about the hostel beforehand, I expected a nice, sociable hostel with great atmosphere. Breakfast and location was super, but sharing only one dirty toilet on an entire floor was a bit poor. The hostel is ok if you wanna stay only for a few days. You need to work on your organization and please fix the fan and the A/C. Since it’s located in an active street, it’s difficult to fall asleep with all the noise!